500 feet with 1080i/1080p signals and digital audio. IR Port: Supports an IR sensor (3 wires) or emitter (2 wires) via 3.5mm (1/8") jack. Simple connections on the rear support tool-less wiring or typical punch-down tools. Fits in standard single gang junction box. Ships assembled with White decorator plate. A light almond face plate is also included in the package for easy in-field changes. Note: Cat5e cable is still limited to a maximum of 328 ft (100 m) in length that should include the length of patch cables that interconnect equipment. Cat 5e cable performance characteristics and test methods are defined in TIA/EIA-568-B.2-2001. Cat5e solid conductors are for distribution (typically) whereas Stranded conductors are usually reserved for flexible needs such as patch cords and cables. AWG conductor sizing is typically 24, comes in pairs of 4, and UTP (Unshielded Twisted Pair). When using LAN (Local Area Network) cable such as this is used in areas of likely ambient interference that would slow performance from the 350 MHz bandwidth and degrade 100 Mbps (100BASE-TX) potential performance, then SHIELDED Cable is recommended and you would then look for the STP moniker that indicates Shilded Twisted Pair. If the cable is run near or in Air handling spaces, then you should check the local building codes pertaining to Plenum cable use as each jurisdiction can be different in definition and guidance. Riser rating is something recommended as a minimum for all interior (in wall) use. CM is for exposed runs and CMX is exteriror rating, though not necessarily UV ray resistant to degradation. CMXT and CMXT are discriptor examples that intonate exterior (X) and flooded (F) or Taped (T) for Underground Use (Direct Burial). Cat6 cable is still limited to a maximum of 328 ft (100 m) in length that should include the length of patch cables that interconnect equipment. Cat6 cable performance characteristics and test methods are defined in TIA/EIA-568-B.2-2001. Cat6 solid conductors are for distribution (typically) whereas Stranded conductors are usually reserved for flexible needs such as patch cords and cables. AWG conductor sizing is typically 23, comes in pairs of 4, and UTP (Unshielded Twisted Pair). When using LAN (Local Area Network) cable such as this is used in areas of likely ambient interference that would slow performance from the 550 MHz bandwidth and degrade 1000 Mbps (1000BASE-TX) potential performance, then SHIELDED Cable is recommended. 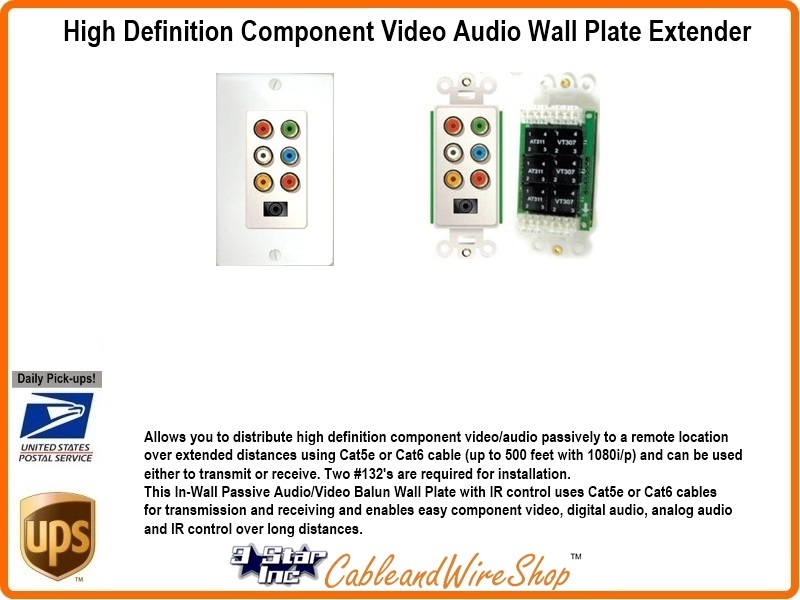 Surround Sound Home Theater Wall-Plates that incorporate HDMI, RCA, F and other Popular Connections in Combinations for Installing In Home Theater and Surround Sound Entertainment Applications. 5.1 ("five point one") is the common name for six channel surround sound multichannel audio systems. 5.1 is now the most commonly used layout in both commercial cinemas and home theaters. It uses five full bandwidth channels and one low frequency enhancement channel (the "point one"). Dolby Digital, Dolby Pro Logic II, DTS, and SDDS are all commonly 5.1 systems. 5.1 is also the standard surround sound audio component of digital broadcast and music. All 5.1 systems use the same speaker channels and configuration, having a front left and right, a center channel, and two surround channels. Blu-ray and Digital cinema both have eight-channel capability which can be used to provide either 5.1 or 7.1 surround sound. 7.1 is an extension of 5.1 that uses four surround zones: two at the sides and two at the back. 7.1 ("seven point one") surround sound is the common name for eight channel surround audio systems. It adds two additional speakers to the more conventional six channel (5.1) audio configuration. 7.1 surround sound positional audio uses the standard front, center, and LFE (bass) speaker configuration. In its most common configuration, 7.1 surround sound includes two speakers positioned to the side and two to the rear. 7.1 surround sound can also refer to 5.1 surround sound configurations with the addition of two front height channels positioned above the front channels or two front wide channels positioned between the front and surround channels. The Blu-ray Disc and the HD DVD home video formats provide up to 8 channels of lossless DTS-HD Master Audio, Dolby TrueHD or uncompressed LPCM audio at 96 kHz/24-bit. The Sony PlayStation 3 video-game console can output up to 7.1 LPCM through HDMI for both Blu-ray movies and games.